Everybody's inner geek probably has an inner rocket scientist that has probably contributed great theoretical advances to inner rocket science, advances that the real world is probably not ready for at present! :) The past couple of months I have had the pleasure of letting my inner geek rocket scientist out to play with the actual rocket scientists! I wanted to share some of my experiences. Delft Aerospace Rocket Engineering (DARE) has built a rocket over the past two years: Stratos III. It is a 8.2 meters high rocket powered by a hybrid fuel engine. The aim of the Stratos III project is to break the European altitude record for student rocketry which is currently set at 32.3 kilometers. I met Jesse Hummel, the Stratos III team manager, at a knowledge seminar about VR where we both were invited to speak about our passion. After an inspiring chat we were both pretty much convinced that VR and rockets are a great fit and agreed to look for an opportunity to put them together. That opportunity presented itself when the Stratos team was invited to show their rocket off at the International Festival of Technology that was held in June on the TU Delft campus. 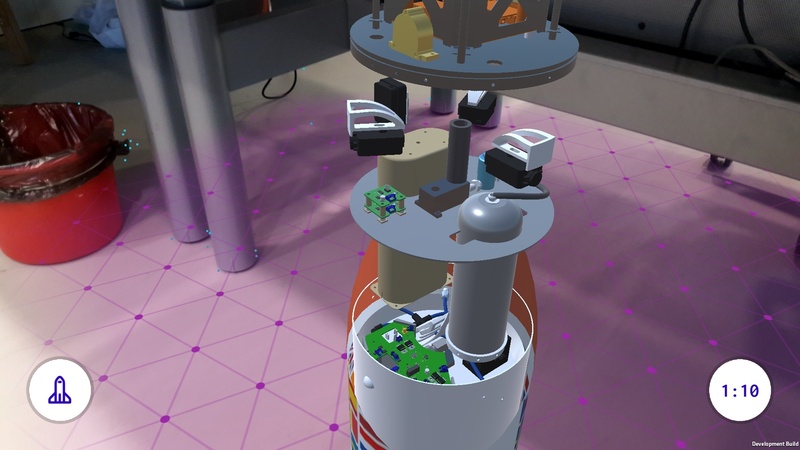 Jesse contacted me to see if I was interested in creating a VR experience to present the rocket at the festival. Needless to say that happened and it was very well received by the visitors of the festival, the teachers at the university and also the team members themselves! During the development of the VR experience I also experimented with the Stratos III assets and implemented an augmented reality app. 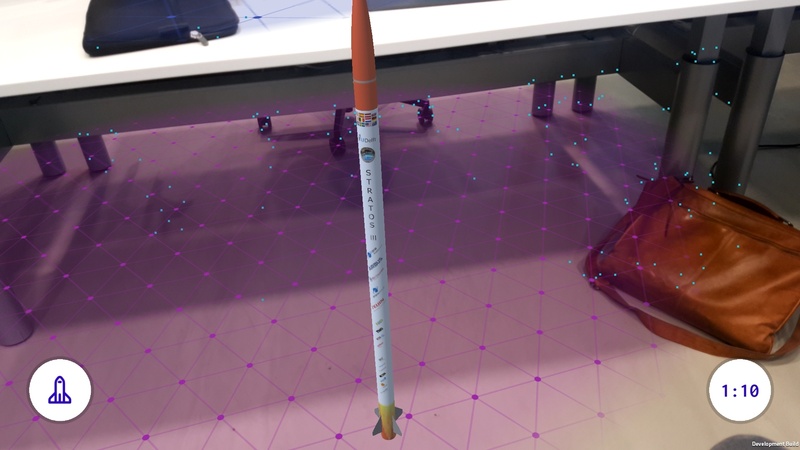 We have decided to develop and polish that app so everybody can take a closer look at Stratos III to see what an actual rocket looks like from the inside. It is available now in the Play Store and within a few days also in the App Store. (Name of the app: Stratos III). To create the app I used Unity, Unity has some great plugins available that can get you started with an AR prototype in no time. It also has support for a lot of platforms, for now I have settled for Android and iOS. The Stratos III model was based on the original CAD designs created during the design of the rocket, one of my biggest lessons learned is that not all 3D models are created equally. CAD applications have a pretty different idea about what a 3D model should consist of compared to a real-time 3D rendering engine. Using models based on CAD drawings gets you a huge amount of detail which took a lot of manual editing to end up with a model that would lend itself for real-time rendering at a decent framerate whilst being mixed in with your surroundings. The user interface of the early prototype was put together quickly at the time and wasn't something I'd put in the hands of the general public. Luckily I had some help of fellow Xebian Dylan de Heer who made sure the app not only looks pretty and doesn't hurt your eyes anymore but is also operable by the masses without any further explanation by me! The tutorial was pretty fun to work on because it should not only explain the static buttons on the screen but should also explain how the user is expected to interact with virtual objects mixed into the real world. Lessons learned: draw a storyboard before implementing a tutorial, using the Unity event system is a very pleasant way to manipulate state for the tutorial steps by drag-and-drop instead of having to hard-code the state changes. Jesse told me there are numerous things that can lead to postponing a launch and so they are assigned multiple launch windows. I had to think of something to update the countdown timer so that a cancelled launch would not require a new release as Apples reviews can potentially span a couple of launch windows by itself. Implementing Unity analytics to change remote settings that are loaded when the app starts fixed that problem. The countdown timer can be dynamically changed or turned off for everyone in the analytics dashboard. All in all it was a great experience, I can now say without a doubt that rockets, VR and AR are indeed a perfect fit. The Stratos III rocket has been a great source of inspiration for me to explore my passion even further, for the Stratos team it has also been a two year investment of time and effort. At the time of writing they are only two days away from launch which means they will effectively blow it up and recover a only small part of it to take back home with them. The app will still be around as a testament of their achievements, I hope they will enjoy it. Let's get the record back! 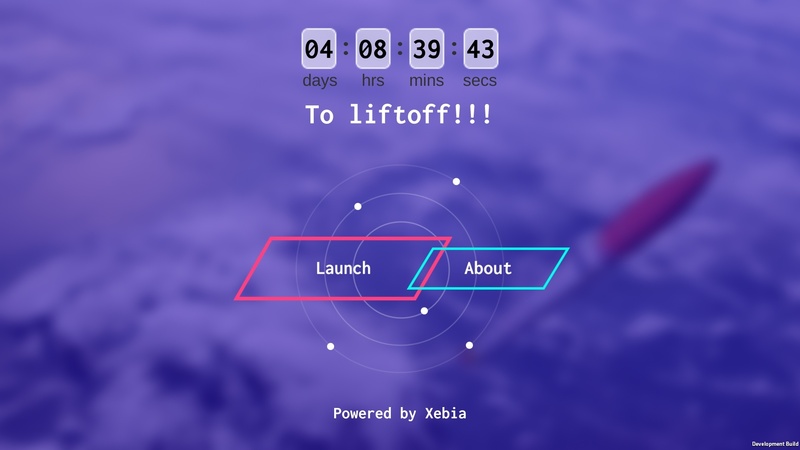 Visit the Stratos III launch campaign page to check the latest news about the launch!